Are You Getting Ripped Off On Your University Fees? You pay a fortune for university fees. You don’t have to put up with rats in the kitchen or incompetent professors. Learn what rights you have as a student and how to get value for money out of your university fees. Only 40% of students thought they got value for money out of their university fees. Students are protected under the Consumer Rights Act 2015 an have full legal rights. It’s a huge decision, made by people who are just starting out on their independent financial lives. But, in a shocking statistic, 85% of full-time undergraduate students are satisfied with their university experience. Only 40% thought that they got value for money. So, if you have rats in your kitchen, mould in your bedroom cupboard and bad quality lectures, who, if anyone can you complain to. And, what are your rights? How do you get a good deal for your hefty university fees? Higher education is often one of the largest and most expensive costs in bringing up children. And besides for the huge university fees, many students pay a fortune for living costs, often taking side jobs or student payday loans to get by. Yet, student life is notorious for dire living conditions which you can nothing about. Or can you? Is there anything that students can do to improve their conditions? The UK higher education system is one of the most expensive in Europe. So what do students get in return for their money? Is there any law that protects students and the money they invest for this pricey education? Firstly, universities need to provide clear pre-course information so that students know what to expect. Secondly, the terms and conditions need to be clear, fair and balanced. Thirdly, universities need to ensure that there are clear procedures for complaints handling that are accessible and transparent to students. Your course, such as the length of the course and what your expected workload is. Your tuition fees including any other costs that you are likely to incur. The terms and conditions set out your rights and obligations within the university, and what the university is obliged to do for you. You should receive the terms and conditions before you accept a place in a university. Your university needs to have a fair and accessible complaints handling process. They also might have a complaints handling process under the Quality Assurance Agency for Higher Education. If there is any information that you feel you should have received, you can make an official complaint. Read below about how to make a complaint. What can you do if you are not happy with your accommodation? Your rights and procedures to complain will depend if you are in university accommodation, or you are in private accommodation. It is usually easier and more straight forward to complain about your living quarters if you are in university accommodation. You do not have to grit your teeth and bear it when the shower spurts out freezing cold water, or your mattress smells of rotten eggs. You should first complain to your university. The complaints process should be transparent and accessible. You should have been given information about how to complain before you accepted a space at your uni. Often you will have a student advice team or student support team that will be your first port of call. Check on your uni’s website if you are not sure how to complain. If you complain and you are not happy with how your university resolved the issue, you can take the case further to the Office of the Independent Adjudicator. The OIA is an independent body set up to review student complaints. It is free to all UK students, and they will take up your case. Don’t be shy to complain. More and more students are getting fed up with the dire living standards and are turning to the OIA for help. In 2006, the OIA received 586 requests for help. But only nine years later in 2015, they were dealing with nearly 2000 complaints. You don’t have to suffer in silence because you are worried that your complaint will affect your marks. You have the legal rights to live like a decent human being, and you have the power to enforce that. When dealing with a private landlord, it can be much harder to make your voice heard. There have been too many cases of landlords taking advantage of students. Some refuse to give back student deposits, while others neglect the property and refuse to repair or maintain it. You may end up paying for repairs yourself, even taking out a small loan for students to cover the costs. You do not have to put up with it just because you are a university student. If you are fed up of dire living conditions, you can put in a complaint and make things change. Your first stop should be your student union. They should be able to give you independent advice on how to deal with private landlords who maltreat students. You can also look at the National Union of Students website. The NUS is an organisation that fights to give students the best chance at uni. It is students driving change and making sure that students can thrive in uni. You can find information there about how to complain, or get in touch for help and advice from NUS. What can you do if you are not happy with the quality of your course? One of the most common complaints from university students is that the course is too long. Many summer terms have little to them, with just a few exams dotted here and there. Can universities not condense their three-year courses into two years and save students the hefty bill of an extra year of education? The first thing to realise is that in some cases there are valid reasons for stretching out courses over three years. But still, there have been cases where lecturers are involved in their research and have therefore drawn out the courses to make time for their personal interests. Therefore, if you are not satisfied with your course arrangements, or if you felt that the course was not delivered to a satisfactory standard, you have legal rights to complain. Universities have to provide courses with what is called “reasonable skill and care.” So, if you or your fellow students feel that you didn’t benefit from the lectures or that it was too drawn out, you can follow the universities internal complaints procedure. This should be transparent and easy to follow. Be aware that in some cases, if the course was not delivered to satisfaction, you may be eligible for a reduction in price. Hence, it is worthwhile complaining if you feel you have some substance to your complaint. You have rights, like any UK citizen to get a fair deal for the money you spent. University fees are huge and are only growing. It’s not just short term debt – you will likely be paying off your fees for many years. There is no reason that your years of student life should be the lowest in quality of life. Make sure you get your money’s worth out of every last penny! 5 Myths About Student Finance in the UK Busted! Will the Interest Rates for Student Finance Loans Change? 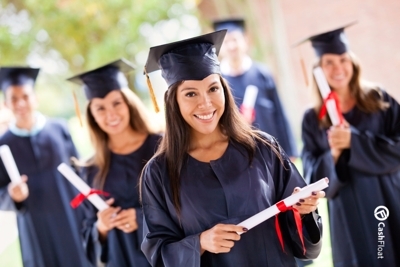 How Do Student Loans Affect your Credit Report?